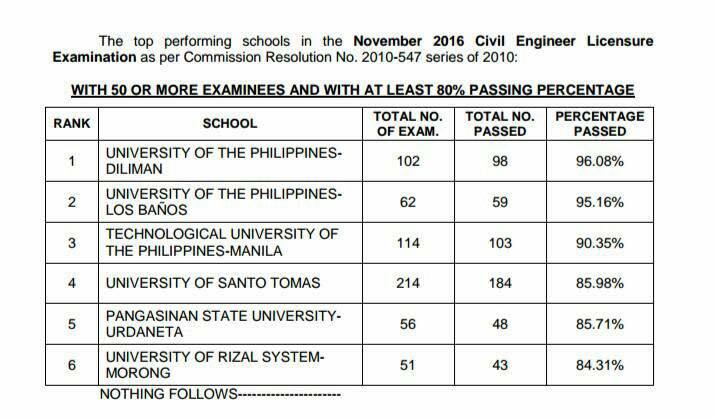 The Pangasinan State University – Urdaneta Campus has once again proved its excellence and exemplarity by ranking 5th among the top performing schools in the November 2016 Civil Engineering Licensure Examination. 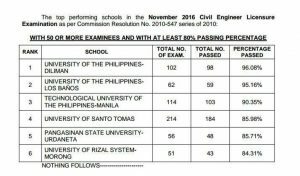 In just two working days after the last day of examination, the Professional Regulation Commission (PRC) announced that 534 out of 918 passed the Civil Engineer Licensure Examination, 48 of which were from the PSU-Urdaneta Campus. Garnering an 85.71% passing rate, Urdaneta Campus was placed among the top universities in the Philippines like the University of the Philippines – Diliman, and the University of Santo Tomas. The Dean of College of Engineering and Architecture, Engr. Resurreccion V. Garrote said that the “enthusiasm and diligence of the graduates” as well as the “commitment and dedication of the faculty” contributed to the high performance of the board passers. She also said that 99.9% of their success was attributed to the discipline and hard work of both the students and the faculty. Future board exam takers are encouraged by Engr. Garrote to “do their best and do what is right and to develop a sense of responsibility and discipline.” She also urges them to focus more on their studies and to refrain from using their gadgets too much. According to her, these are the important aspects that aspiring future engineers should always keep in mind.